In light of the current Fire Emergencies around our county. WE ARE CANCELING small groups for Wednesday night, October 24, 2007. If you have needs yourself or as a family, please notify the office and we'll do our best to help your needs or e-mail me: brian at journeycom.org and I'll do what I can. Next week is still currently our 80's party as planned and our small groups will resume as normal on November 7 unless otherwise noted. This October 31st from 6-9pm. Journey's high school ministry is in charge of watching two jump houses during the Fall Festival at Journey. Normally we uses students to do this. Problem is, this year we're trying to reach out to our non-christian high school students and providing an outreach for them. So, we need some parental help in the gaps. Can you man a jumpy house for an hour for us so our students can reach their friends instead of watch over the jump houses? If so, please contact Aundrea in the office by dialing 619.464.4544 and asking for her and signing up. Thanks!!! 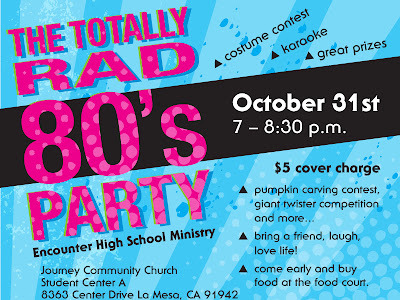 Oh.. and here's some details for your students if the want come to our 80's night. Just give the flyer below a click and it will be readable and have all the info you need. thanks for your prayers and helping hands. Two articles of note came up today and as I head home after youth group, I thought I'd take 5 minutes a just point you to them before I forget. Josh Treece, our middle school pastor, had heard a lot of feedback from parents about what to do to help protect your teen online. He found a helpful article and posted it here. You should check it out. The simple fact is that, like it or not, your students are online. They are going to be gathering where their friends are. They will log into MySpace, Facebook or AOL (and whatever’s next) before most of you have had your morning coffee. With that in mind, how can you help students navigate the world of online social networking? OCTOBER 3- Small Groups. Guys are from 6:30 to 8:30pm in student center A... and cost $3 for dinner. Girls groups meet in homes from 7-9pm for the most part. Let us know if you want to get your student involved and we'll get you the info on directions and such to make sure your student can be with us! OCTOBER 17- GLORIFY: A worship/communion/prayer night in student center A from 7 to 8:30 pm. Any high school student who wants to join us from this night is welcome.